Most of us love it, some of us crave it. Did you know that chocolate in its most natural form, raw cacao, is an absolute powerhouse on the nourishment/nutrient-density continuum? Raw cacao – and what I’m describing here is chocolate in its truest form…raw chocolate…not chocolate with milk solids and lots of sugar added to it that lower its medicinal and healing properties – is a source of body-loving antioxidants and provides ample amounts of body-boosting minerals like magnesium and iron. It is ‘raw’ – meaning it has been milled (and heated) at low temperature to preserve and protect nutrients and flavor. It is a healthier version of the higher-processed, higher-heated, commonly-used cocoa powder, and in its raw powder form, it creates ‘chocolate magic’ in your pudding, smoothie or mug of warm hot chocolate. Raw cacao is one of nature’s most fantastic superfoods, containing the highest concentration of antioxidants of any food on the planet! It is known as THE FOOD OF THE GODS. Raw cacao provides anandamide, a cannabinoid endorphin that the human body naturally produces after exercise. This is known as the ‘bliss chemical,’ hence, when we eat raw cacao, we feel great! So, what’s the difference between Cocoa Powder and Raw Cacao Powder? First of all, this is not a typo (i.e. ‘cocoa’ vs ‘cacao’). And now that I’ve expounded on the beautiful health benefits of good quality cacao/raw chocolate, let me help explain when to opt for cocoa powder and when to go the route of raw cacao powder. Yes, raw cacao powder is pricey but a little goes a long way on the quality, flavor and health scales. While there are some excellent cocoa powder options on the market, studies show that raw cacao powder stands out as the healthiest, most beneficial option of the chocolate powders, followed by natural cocoa and finally, Dutch-processed cocoa. This means that you reap the greatest health benefits of chocolate by eating the powder unheated – aka RAW cacao (i.e. 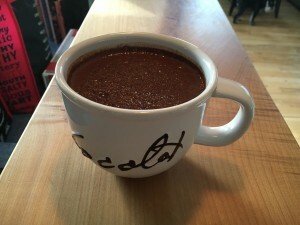 in a smoothie or other raw food dessert, for example, or even a hot chocolate elixir – just don’t boil your liquid). The antioxidant activity is greatly reduced by cooking, refining and processing, which is how cocoa powders are made from raw chocolate. So, simply put: if you’re planning to bake, it is in your best interest to save some pennies and use a good-quality natural or Dutch-processed cocoa. This is great! Save your antioxidant-heightened raw cacao powder for your unbaked goodies. Another way to get your chocolate love on is by indulging in dark-as-you-can-go chocolate bars! Consider at least 70% chocolate or try one of these: an 85% or 90% version. Basically, higher percentages tell mean you are reaping more health benefits – they are closer to chocolate in it’s raw form. (I have a friend who orders 100% raw chocolate bars online – she is a veritable connoisseur and pays ridiculous amounts for her chocolate love. 100% cacao bars are an acquired taste, by the way! Being a nutritionist, though, she knows the amazing health benefits of her chocolate obsession!) Note that studies also show that small amounts of very dark chocolate help reduce stress hormones – including cortisol – and give a boost to the production of two of the neurotransmitters that boost our mood, serotonin and dopamine. Like with any food, check in with your body when you try something new. For example, when it comes to chocolate, I need to exercise caution. I love the taste and it’s myriad of health benefits but can only indulge occasionally because my unique physiology doesn’t react well to eating it with regularity. And because it does have small amounts of caffeine – and I am uber-sensitive to caffeine – I must be careful with timing when I do indulge. Eating it before bed doesn’t work for me as I likely won’t sleep well. For others, however, a few squares of very dark chocolate before bed helps with sleep due to the relaxing qualities of ample magnesium. Go figure. This is yet another example of ‘just because it’s healthy doesn’t mean it works for your body!’ – a gentle reminder to listen to your body’s messages. There you have it! If you enjoy chocolate, why not try a higher-percentage, good quality brand, and pop a square in your mouth. Let it melt on your tongue. Taste, feel – be utterly present and savour the moment!